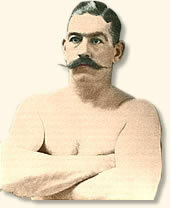 John L. Sullivan became a legend in his own time. He had won the Heavyweight Championship title in 1882 and had successfully defended it for 10 years. He was the last of the bare-knuckle champions who pounded each other without gloves for hours in marathon matches that lasted for as many as 75 rounds. Sullivan rose to the pinnacle of his profession at a time when many states and local jurisdictions outlawed boxing matches giving the sport a status that lay somewhere between marginal respectability and outright criminal behavior. Nonetheless, Sullivan's championship matches attracted thousands. behavior and dampening the potential barbarism of the ring. 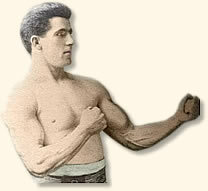 At the same time, the boxing clubs that formed the foundation of the sport standardized the various weight classes. Boxing was making a transition to a legitimate, money-making form of sport. Jim Corbett represented the new age of boxing. He had learned his craft not on the street but from a coach. He had attended college and worked as a bank clerk before turning to the sport. He began his career in 1886 and had fought all of his matches wearing gloves and under Queensberry rules. Because he wore his hair in a full-grown pompadour, dressed smartly and used excellent grammar when he spoke, he became known as "Gentleman Jim." On September 7, 1892 the two men met in New Orleans in a Heavyweight Championship match governed by the Queensbury rules. The Sullivan-Corbett fight of 1892 marks a watershed for professional boxing as the sport moved out of the shadows of criminality into the realm of acceptable public entertainment. "He came out of his corner like a roaring lion." "Now, I knew that the most dangerous thing I could do was to let Sullivan work me into a corner when I was a little tired or dazed, so I made up my mind that I would let him do this while I was still fresh. Then I could find out what he intended doing when he got me there. In a fight, you know, when a man has you where he wants you, he is going to deliver the best goods he has. From the beginning of the round Sullivan was aggressive-wanted to eat me up right away. He came straight for me and I backed and backed, finally into a corner. While I was there I observed him setting himself for a right-hand swing, first slapping himself on the thigh with his left hand-sort of a trick to balance himself for a terrific swing with his right. But before he let the blow go, just at the right instant, I sidestepped out of the corner and was back in the middle of the ring again, Sullivan hot after me. I allowed him to back me into all four corners, and he thought he was engineering all this, that it was his own work that was cornering me. But I had learned what I wanted to know - just where to put my head to escape his blow if he should get me cornered and perhaps dazed. He had shown his hand to me. ...So far Sullivan hadn't reached me with anything but glancing blows, and it was my intention, when the third round started, to hit him my first punch, and I felt that it must be a good one! If my first punch didn't hurt him, he was going to lose all respect for my hitting ability. So, with mind thoroughly made up, I allowed him to back me once more into a corner. But although this time I didn't intend to slip out, by my actions I indicated that I was going to, just as I had before. As we stood there, fiddling, he crowding almost on top of me, I glanced, as I had always done before, first to the left, then to the right, as if looking for some way to get out of this corner. He, following my and thinking I wanted to make a getaway, determined that he wouldn't let me out this time! For once he failed to slap himself on the thigh with his left hand, but he had his right hand all ready for the swing as he was gradually crawling up on me. Then, just as he finally set himself to let go a vicious right I beat him to it and loosed a left-hand for his face with all the power I had behind it. His head went back and I followed it up with a couple of other punches and slugged him back over the ring and into his corner. When the round was over his nose was broken. At once there was pandemonium in the audience! All over the house, men stood on their chairs, coats off, swinging them in the air. You could have heard the yells clear to the Mississippi River! But the uproar only made Sullivan the more determined. He came out of his corner in the fourth like a roaring lion, with an uglier scowl than ever, and bleeding considerably at the nose. I felt sure now that I would beat him, so made up my mind that, though it would take a little longer, I would play safe. From that time on I started doing things the audience were seeing for the first time, judging from the way they talked about the fight afterwards. I would work a left-hand on the nose, then a hook into the stomach, a hook up on the jaw again, a great variety of blows, in fact; using all the time such quick side-stepping and footwork that the audience seemed to be delighted and a little bewildered, as was also Mr. Sullivan. That is, bewildered, for I don't think he was delighted. When we came up for the twenty-first round it looked as if the fight would last ten or fifteen rounds longer. Right away I went up to him, feinted with my left and hit him with a left-hand hook alongside the jaw pretty hard, and I saw his eyes roll. . . . Summoning all the reserve force I had left I let my guns go, right and left, with all the dynamite Nature had given me, and Sullivan stood dazed and rocking. So I set myself for an instant, put just 'a little more' in a right and hit him alongside the jaw. And he fell helpless on the ground, on his stomach, and rolled over on his back! The referee, his seconds and mine picked him up and put him in his corner; and the audience went wild." Corbett, James John, The Roar of the Crowd: the true tale of the rise and fall of a champion (1926); Gorn, Elliot J., The Manly Art: bare-knuckle prize fighting in America (1986). 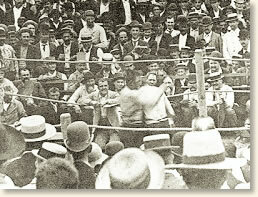 "Gentleman Jim" Corbett Knocks Out John L. Sullivan, 1892", EyeWitness to History, www.eyewitnesstohistory.com (2004).